Disney wants you to have a Blu-ray player. They think it will make their movies look clearer and sound better. But with DVDs and players so cheap and plentiful, why should viewers spend upwards of $300 for a new player, and then shell out even more money for Blu-ray discs? Disney feels your pain. 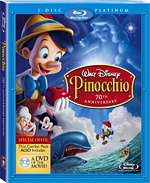 The two-disc Blu-ray edition of Pinocchio includes a third disc, a standard DVD of the movie. That way when you upgrade, you won’t have to buy a whole new DVD set. A standard two-disc DVD set with most of the same bells and whistles as the Blu-ray edition has also been released. Given that standard DVDs will play on Blu-ray players, most fans of Pinocchio should be satisfied with the older, cheaper technology. The financial success of Snow White and the Seven Dwarfs in 1937 paved the way for Pinocchio three years later. The studio’s animators were eager to try new things and now they had a bigger budget to work with. The animation is indeed a wonder, from the whimsical and intricate toys in Gepetto’s workshop to the underwater effects at the end. The use of the multi-plane camera, which puts different picture elements at varying distances from the camera for a three-dimensional effect, is put to stunning use in the wide shots of the Alpine village where Pinocchio is born. The character animation is also striking. Three episodes from Italian writer Carlo Collodi’s book, The Adventures of Pinocchio, form the plot. Pinocchio, a wooden marionette carved by the toymaker Gepetto, comes to life as a very naïve young boy. The cricket, a minor character in the book, is given a personality and put front and center, as the boy’s conscience in a world full of exploitative adults. Some critics of Disney complain that their movies are cruel and manipulative. Indeed, the most memorable parts of Pinocchio are the dark, unhappy sequences. Here, the disobedient child is made to perform for the profit of others. Boys are exposed to the temptations of unhealthy food, tobacco and general rowdiness, only to be turned into donkeys crying for their mothers. The donkey episode doesn’t have the emotional impact of the death of Bambi’s mother, but it’s more disturbing. Pinocchio is made of the same stuff as so many fairy tales. Bad things happen to children, and through luck or pluck, the heroes make things right. Though the movie has plenty of villains, the plot doesn’t require them to fall to their deaths to make for a tidy conclusion. A happy ending brought about by the hero’s personal growth is much more satisfying. Cine-Explore is a commentary option that has picture-in-picture popups. Sometimes we see the three commenters, other times we see illustrations of the comments. When they talk about a sequence from Snow White, a clip of it pops up. On the whole, it isn’t any more illuminating than simply listening to the commentary while watching the movie. Pinocchio Knows Trivia Challenge has different levels of trivia about the movie. The Blu-ray disc also links to Disney’s BD Live Network online. Your player must have an internet connection to access this feature. One downside to the Blu-ray discs (as we discovered, after upgrading the player for this review), is that they take longer to load than their standard counterparts. This was particularly noticeable (and a little annoying) with the games. Also, if you want to get to the main menu, do not press the Home button on your remote, you will have to start over. Disc one features a commentary track with film critic Leonard Maltin, Disney animator Eric Goldberg, and animation historian J.B. Kaufman. Maltin, who has appeared in many Disney DVDs in recent years, has a talent for pointing out the obvious. Goldberg and Kaufman are knowledgeable about details of the production and keep the commentary lively and interesting. Included in the mix are audio clips of old interviews with animators who worked on the movie. A pop-up trivia option, has facts about the movie, the book, and just about anything else peripherally related to the story. The Music and More section has a skippable music video with Disney starlet Meaghan Jette Martin singing When You Wish Upon a Star. This section also has Disney Song Selection, which allows viewers to watch the songs with the lyrics as subtitles. For anyone concerned about the images of children smoking, the disc begins with an anti-smoking public service announcement before proceeding to the trailers of upcoming movies. On disc two is the 56-minute “No Strings Attached: The Making of Pinocchio,” which thoroughly covers the making of the movie. Fans of the movie should find it interesting, though some information is repeated on the commentary track. Three deleted scenes are presented as a sequence of storyboard images with voice acting and narration. A storyboard sequence with an alternate ending is also in this section, as is a recording of a deleted song. Delving even deeper into the making of the movie are short features on the storyboard process, the use of live actors, as well as extensive galleries of sketches, background paintings and models. Two games on this disc will be of interest to the youngest viewers. This DVD release boasts a new digital restoration of the film. The picture on both the standard and Blu-Ray DVDs is flawless. The Blu-Ray image is a little sharper than the standard DVD image. It’s a subtle difference, and anyone considering an upgrade might want to wait until there are more titles available on Blu-Ray. The text in the pop-up trivia boxes was much sharper on the Blu-Ray disc. The enhanced soundtrack sounded very good in our home theater. Whether you listen to it in DTS 7.1, Dolby Digital 5.1 or basic 2.0 will depend on your system’s capabilities. The aspect ratio is the original 1.33:1. It must have occurred to someone at Disney that folks with widescreen televisions might not like those black bars on the either side of the picture. For those people, the Blu-ray disc has an option called Disney View. In place of the bars are paintings that are meant to go with the images on the screen. In some shots, there are stars to expand the night sky. Many of the interior sequences are now “enhanced” with decorative wooden beams along the sides. The effect is reminiscent watching a movie at an old movie palace with decor along the sides of the screen. This viewer found it distracting. After watching the movie, switch to disc two for the making-of featurette, then check out the deleted scenes. Want to know more? Listen to the commentary track, but save it for another time.